Is black tahini the new black? Earlier this spring, Seed + Mill, the Chelsea Market artisanal tahini and halva stand in New York City, introduced a new flavor to great fanfare: A trapezoidal cake of inky black sesame halva posted on their Instagram account generated nearly a thousand likes and dozens of excited comments. The frenzy around Seed + Mill’s new black sesame halva begs the question: Is black tahini the new, well, black? 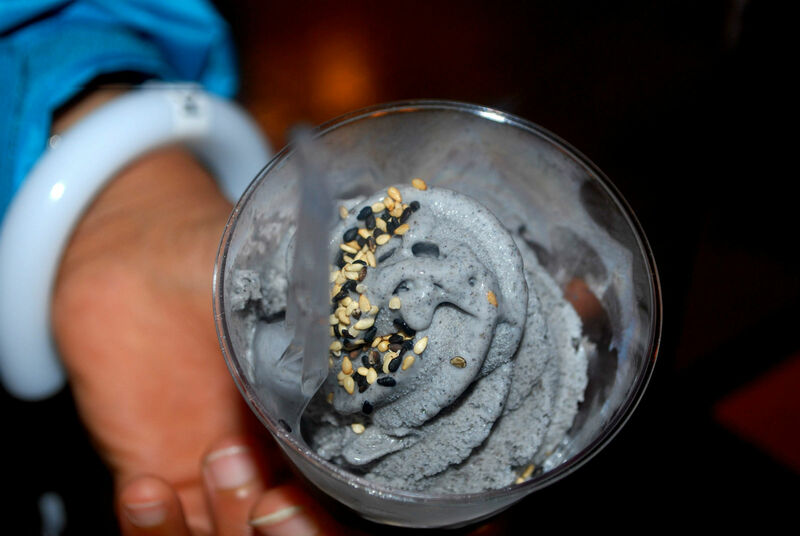 A paste made from unhulled, roasted black sesame paste, known as nuri goma, is a popular ingredient in Japanese ice cream, pastries and baked goods, especially when sweetened with sugar or honey. Nuri goma imparts a roasted, nutty flavor with earthy undertones to these dishes. Nuri goma sounds a lot like tahini, Israel’s beloved and practically ubiquitous sesame paste. But tahini is typically made with white or tan sesame seeds. Is there such a thing as black tahini? Well, of course there is. How else would Seed + Mill make its black sesame halva? But here is where things get complicated. According to Inbal Baum, founder and CEO of culinary tour company Delicious Israel, in Israel, “black tahini” can be one of three things. First, and most straightforwardly, “black tahini” could simply be a paste made from black sesame seeds. But, Baum says if you see “black tahini” on a menu in Tel Aviv, you will most likely encounter regular tahini that has been colored “with some sort of blackening agent — usually roasted eggplant skin — which makes it very smoky.” Just to make things really complicated, the phrase “black tahini” is also sometimes used to describe a bitter paste made from ground nigella seeds — called qizha in Arabic — which is used in Palestinian cooking and is a different thing entirely. 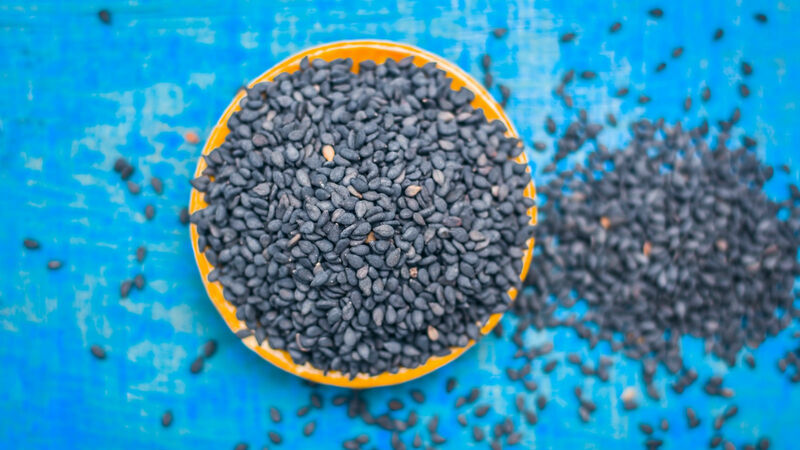 For now, black sesame seeds may be more common in Israel’s Asian restaurants than in the tahini at the local falafel stand. But Lisa Mendelson of Seed + Mill — who grew up in Israel — sees that changing. According to Mendelson, as Israelis travel more and become exposed to different cuisines, they have become increasingly open to trying new ingredients and even incorporating those ingredients into traditional Israeli dishes. So while Mendelson hasn’t seen black hummus yet, she thinks it is only a matter of time. Here in the U.S., where tahini is not as fundamental to daily life, consumers are even more open to the novelty of tahini made from black sesame and its unique flavor profile. Mendelson reports that Seed + Mill customers love the new black sesame halva in part because it less sweet than the company’s other varieties. The recipe for the black sesame halva uses the same amount of sugar, but because the black tahini itself is more bitter, the result is less sweet. Shelby Zitelman, the CEO and co-founder of Soom Foods, manufacturer of Chef Michael Solomonov’s favorite tahini, agrees that black tahini tastes different than regular tahini. “It’s really rich,” says Zitelman. Think you can handle the intensity of black tahini? Kevala, a natural foods company, makes a black tahini from organic, unhulled black sesame seeds. (By the way, do not fall into the trap of thinking that white sesame seeds are black sesame seeds with the hull removed. Black sesame seeds would look white if their hulls were removed, but they are not the same as white sesame seeds. Got it?) You can use Kevala’s black tahini anywhere you would use regular tahini, but Lisa Mendelson especially recommends using it for baking. 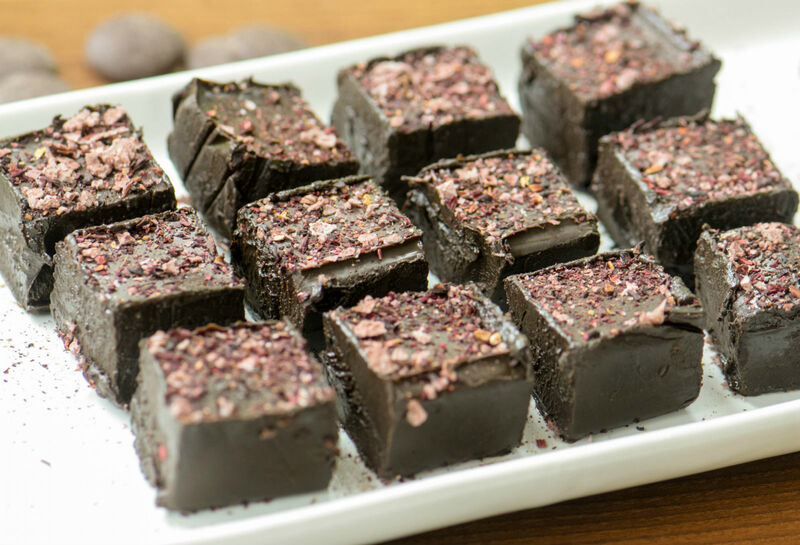 Mendelson makes a guilt-free, low-sugar, vegan black tahini truffle that is exceptionally rich, nutty, and creamy. Love the dramatic color of black tahini? It also makes a striking natural food dye. No eggplant skins needed. Lisa Mendelson says this is an Asian twist on Seed + Mill’s classic tahini truffle recipe. The nuttiness of the black sesame is perfect with intense dark chocolate. Line a small loaf pan with plastic wrap. Melt chocolate in a double boiler or a pan set over very low heat. our into prepared loaf pan. Sprinkle with black sesame seeds and salt. This recipe comes to us from Inbal Baum of Delicious Israel and uses charred eggplant skin to turn regular tahini black and give it a smoky flavor. Char the eggplant over an open gas flame until the eggplant softens, turning it using tongs. Remove and let cool slightly. Peel and set aside the charred skin. In a food processor or strong blender, process eggplant skin with 2 cloves garlic, 1/4 cup of the tahini, drizzle of lemon juice, and honey, then add water gradually until creamy. Mix with salt and pepper to taste and set aside. Line a baking sheet with parchment paper and preheat oven to 400. Fill a large pot that will fit the whole cauliflower with salted water, and bring to a boil. Once the water is boiling, add cauliflower (white side down) and boil for 8 minutes or until fork tender. Carefully remove from water and transfer to baking sheet. 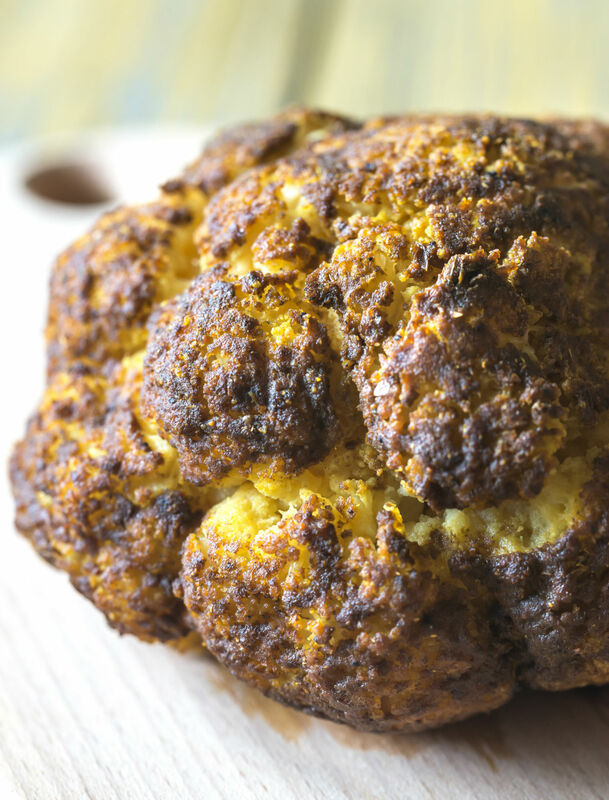 Allow cauliflower to cool and dry. Coat blanched cauliflower generously with olive oil and sprinkle with coarse salt. Bake in preheated oven until the cauliflower is golden, about 30 to 40 minutes. Spread black tahini on a platter and place whole roasted cauliflower on top. Drizzle with remaining 1/2 cup tahini and sea salt. Serve immediately. A guide to two tasty Middle Eastern sesame products.